I only need the caricature in ink, not colour. The final outcome of the caricature drawing is typically like what you do for liveshows, the presentation of the drawing is such that it's usually a head, half body (at least can see both arms), no background that kind. I never get to attend your live sketching events so I hope to have something like that done with reference of pictures. ...."
Didn't realise that my live caricature sketching can attract customer orders, as I always think that those artworks which I really spent more time have more convincing power. Since she's one of my blog followers, I shouldn't disappoint her. 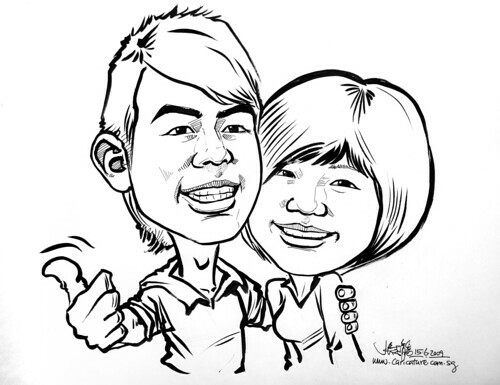 In fact, this caricature artwork has more substance than those I did for live sketching. I added in G-pen fine strokes besides the bold brush strokes. Not too weak, and yet not too bold. It takes up longer time, but it is definitely worth the effort. I still prefer such style, which I have been using for years, since 1995. I would say after 14 years of using these 2 mediums, I can control them better. They seldom failed me. Thanks for the caricature done for us! I really like it! Sorry that we didn't really have big reactions that day. After we brought it home, we kept admiring it! My boyfriend & I really love it! It really looks like us! Thank you! Will definitely engage your services again!